The Evanston Art Center (EAC) is an integral part of community life, providing access and experiences in the arts to people of all ages, backgrounds and abilities. Through free, community based events, workshops, gallery exhibitions and panel discussions, EAC helps expand its mission to provide accessible arts education and arts enrichment experiences to the community and the surrounding areas. We offer art classes for youth, teens, adults, seniors, and enjoy partnering with neighborhood organizations and schools. Grants and in-kind donations are equally important in helping continue these programs at EAC. Please visit our Donation tab for more information on how you can help support our Outreach efforts in bringing accessible art classes, workshops, and programs to the community. EAC partners with Books and Breakfast, an organization that offers a nutritious breakfast and homework help to K-5 students at Evanston’s Dewey, Lincolnwood, and Kingsley elementary schools. Through the partnership, EAC provides arts enrichment projects to youth in each of these locations and included activities such as artist-of-the-month, cultural and heritage events. The Art Center program is free of charge to participating students and is accessible to all. EAC supports Books & Breakfast mission towards helping kids get a nutrient-rich meal as well as fostering a supportive environment for literacy education within the community. EAC partners regularly with Evanston Township High School. EAC hosted the ETHS Art Department for a professional development activity. The aim is to have the teachers be creative in a new setting and recognize the EAC as a field trip destination for their students. EAC also regularly works with Evanston Township High School’s AP 2D Design class, learning screen-printing techniques, creating their own designs, and examining other artist’s work. Generation F-Stop is an annual EAC exhibition that provides a platform for students to gain confidence by displaying their photography work from February through March. Photography instructors have weekly after school classes with Y.O.U. (Youth and Opportunity United) at Lincoln Junior High in Skokie, YWCA’s shelter, and Family Focus. Generation F-Stop centers on photography and journaling as means of self-expression. EAC holds after-school outreach programming for District 65 Schools at Walker and Dewey Elementary schools. The programming serves K-5 students through after school art education classes and meets for three sessions each week during winter and spring sessions. These after-school classes expose students to a variety of art materials, while providing opportunities to explore personal interests and a diverse range of subjects. An Evanston Girl Scout Troop of Brownies, Wilmette Park District kindergarten class, and National Charity League of Wilmette participated in exhibition tours and art making workshops at EAC in January 2019. Two kindergarten classes from Wilmette Park District and National Charity League of Wilmette participated in exhibition tours and art making workshops at EAC in February 2019. EAC collaborates with local real estate brokerage firm @Properties on a monthly workshop series to provide the @Balance program for @Properties staff. Through the workshop series, participants have the opportunity to create art and explore Ceramics, Printmaking, Jewelry, and Painting, as well as visit the music hall Marker Lab Space (SPACE). Each workshop highlights different departments and services offered at EAC, and are designed to provide a stronger work/ life balance for their brokers. Housing Opportunities for Women (HOW) is a nonprofit organization helping empowering women, children and families to break the cycle of poverty and homelessness. EAC partnered with HOW by sending an EAC faculty member to the organization and leading a weekly after-school arts enrichment program for elementary school age children. EAC has a weekly partnership with The Merion, an independent senior living community located in Evanston. EAC offers seniors a drop-in figure drawing class. Over the Rainbow is Chicago non-profit dedicated to increasing the quality of life for individuals with physical disabilities through the creation of affordable, accessible, barrier-free housing solutions and person-centered services that encourage independent living. EAC sends an instructor to OTR Evanston residence to provide a monthly art class for adult residents with disabilities. YEA! was founded in 1987 by local Evanston resident and Dempster Street business owner, Harvey Pranian. The mission of YEA! 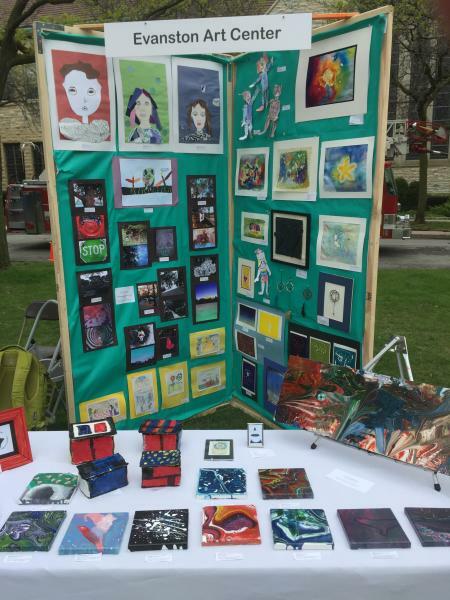 Is to showcase artwork and performances of aspiring Young Evanston Artists through local schools, art programs, and the business community. EAC partners with YEA! during their annual Art Festival and serves as a YEA! Sponsor. Youth & Opportunity United (Y.O.U.) is a youth development agency that provides academic, social, and emotional support for the needs of young people and their families within the Evanston community. EAC is working with Y.O.U. to produce a series of one-day workshops each month for neighborhood youth and families. These one-day art workshops are targeted toward any youth age group and lasts 2-4 hours. The EAC was generously awarded with a $10,000 grant renewal from The Phillip and Edith Leonian Foundation to support enhancements to its Digital Photography program. Covering the expenses of Generation F-Stop outreach program. EAC implemented the outreach component of Generation F-Stop which serves homeless and vulnerable youth. The program combines photography with journal writing as a method for students to identify, examine, and articulate issues shaping their lives. Participants in the program used digital cameras to take photographs, evaluate content, and express their ideas in writing. For this reason, participants kept journal records of their experience throughout the program. A selection of student’s photographs were included in the Art Center’s biennial Youth Fine Arts Student Exhibition. The grant funding has also helped EAC enhance its digital photography department by the addition of new equipment that has served over 100 people throughout this grant cycle. We hope to expand the program to reach more individuals and partner with other nonprofits to share the power of photography and artistic expression. To view our Phillip and Edith Leonian Foundation Grant booklet, please click here. For additional information about our Outreach Programs and to get involved, please contact Christena Gunther (Director of Education) at cgunther@evanstonartcenter.org or call EAC at (847) 475-5300 ext. 108.